It is nestling in large peaceful gardens in North-West Sandton over several acres of countryside, is a place to rest and relax. Ideal for businessmen-and-women staying in Johannesburg on business (with ADSL in each suite), or for cross country travellers looking for affordable comfort and service. Perfectly situated, minutes away from the Sandton centre and even closer to Fourways shopping and business centres, we offer levels of service, accommodation, comfort and cuisine that stretch expectation, all with more than a hint of individuality - whether you are on holiday or on business. A green and tranquil garden welcomes you to the guest houses, combining the warmth and friendliness of traditional Cape Dutch hospitality and country antiques with all modern comforts – perfectly positioned for relaxation after the busy Johannesburg days. NEARBY: Malls and shopping centers, Award winning restaurants, Fitness center with indoor pool, Golf courses and Driving ranges, Horse riding. Kettle, hospitality tray, coffee machine, microwave in each suite. ‘Starter’ provisions (on request), Selection of teas and coffees, bar fridge. Fax and e-mails received, modem jack in each room. Complimentary car and shoe cleaning. Dry Cleaning drop-off and collect. Reductions made for long stays and frequent bookings. 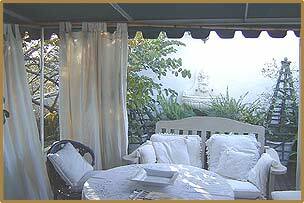 A Honeymooner's favourite - charming and romantic ... a relaxing beautiful place to stay. Stay in The Tree House, charmingly and freshly decorated. A large romantic bedroom leads out into a roof garden with a covered outdoor lounge, where you can relax on a summer evening to the sound of the fountain, or bask in the warm Highveld sunshine in winter. consists of an en suite bedroom, a cozy lounge with fireplace and a private verandah for outdoor dining. It can be made interleading with a larger cottage and extended for accommodating a family of up to six in three bedrooms with en suite bathrooms, a lounge and a conservatory dining room - a covered verandah. Elegant Dovecote has a garden with a covered verandah and its own small study. The Spa at Annie's Tree Houses is an oasis of peace and tranquility. The holistic philosophy aims to harmonise mind and body in an environment of pure relaxation. This is a place to find inner calm, where you can simply relax your mind and let go of your thoughts.